Just in time for the National Association of REALTORS’ annual conference and expo, we’re advertising in “REALTOR Magazine” again. Our full-page ad will be on cardstock, so it will stand out from the rest of the magazine’s ads. The message is aimed at potential franchisees and builds brand awareness. The main image emphasizes Help-U-Sell University, which is debuting in November. 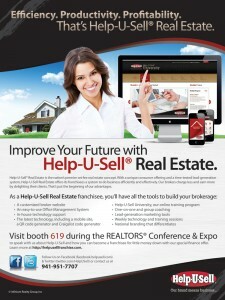 We’re also encouraging readers to visit our booth at the REALTORS Conference and Expo. Look for the ad in the next issue of REALTOR Magazine.